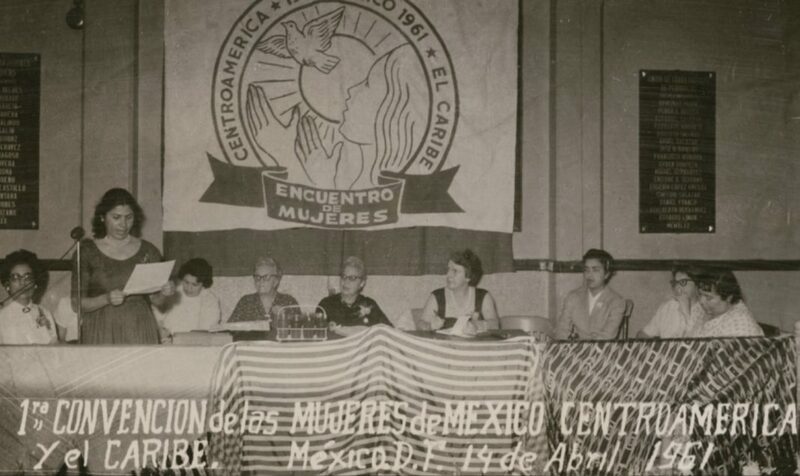 Francisca Flores (second to last on the right) at the First Convention of Women from Mexico, Central America, and the Caribbean, Mexico City, 1961. Courtesy of the California Ethnic and Multicultural Archives (CEMA), Department of Special Research Collections, UCSB Library, University of California, Santa Barbara. In December 1941, an FBI document was approved and signed by the bureau’s bullish chief J. Edgar Hoover. It had information regarding a woman the FBI had classified as “Group A,” a designation reserved for “individuals believed to be the most dangerous and who in all probability should be interned in the event of war.” Though she wasn’t arrested, she would be monitored by the FBI for decades. The woman, who looked more like a nice home economics teacher than a threat to the American way, was Francisca Flores. Flores was born in San Diego in 1913 during the Mexican Revolution. People fleeing the chaos contributed to poor living conditions on the border, which led to an increase in tuberculosis among Mexican Americans. At one point an astonishing one-fourth of Mexicans in the area were infected, Flores included. When she was 15, the same year her brother Vincent died of the disease, Flores entered the Vauclain TB Sanitarium in San Diego County. She spent the next decade in the sanitarium, leaving when she was 26. Much of this time she was forced to lie in a constrictive iron lung. But these years were far from wasted. TB treatment at the time included many hours of rest, sunshine, and fresh air, and Flores took full advantage, reading voraciously and talking with her fellow patients, many of whom were veterans of the Mexican Revolution and introduced her to the radical ideas and writings of revolutionaries like Enrique and Ricardo Flores Magón. “She was galvanized through the stories that she heard from people who fought in the Mexican Revolution,” says Pilar Tompkins Rivas, director of the Vincent Price Art Museum. “She began to organize with other women who basically had survived the Mexican Revolution that were now living in Southern California.” The museum is currently hosting the exhibit Regeneración: Three Generations of Revolutionary Ideology, which details 100 years of Chicano activism. Within the sanitarium, Flores helped found the Hermanas de la Revolución, a group that served as a safe space where women could talk about politics and activism. Through conversations with her nurses, she learned about their meager salaries and began to advocate for their pay to be raised. Flores organized a strike, and the day she was finally released in 1939, she joined the picket line. The nurses got their raise. Free from the sanitarium, Flores moved to Los Angeles and became involved in advocating for Mexican American causes. She jumped right into the fire when she joined the Sleepy Lagoon Defense Committee, a committee of activists, lawyers, writers, and concerned citizens dedicated to freeing the 12 Mexican American young men who had been falsely convicted of the 1942 murder of José Gallardo Díaz. Flores became her own investigator, conducting interviews with community members as well as the friends and families of the young men. She also honed her talent for writing by publishing rousing editorials in Mexican newspapers and magazines including La Luz and Mas Grafica, and in October 1944 the convictions were overturned and the young men were released. Her years in the sanitarium had made Flores particularly fearless. “I only have one lung,” she would often say to her nephew, Dr. Bill Flores. “What’s your excuse?” She openly spoke out against the House Committee on Un-American Activities, even though she knew that authorities believed she was a communist (actually, for much of her life, she was a member of the Democratic Party). In 1954, the feminist, pro-union film Salt of the Earth, penned by blacklisted writer Michael Wilson and directed by the blacklisted Herbert Biberman, was banned in America. Most copies of the film, which sympathetically depicted the lives of striking Mexican miners, were destroyed, and lead actress Rosa Revueltas was deported. But Flores owned a copy, and for years would show it at benefit screenings to provide funding for the filmmakers’ and actors’ legal defense funds. Flores became increasingly involved in feminist organizing within the community. Not only was she one of the only women to cofound the Mexican American Political Association (MAPA), she would eventually found the Chicana Service Action Center in L.A. The center, which helps provide job training and opportunities to at-risk Chicanas, has survived for decades, though it’s had major legal trouble in the last few years. Flores also founded the Comisión Feminil Mexicana, which sought to train a new generation of Chicana leaders and promote community programs to help the Chicana community. 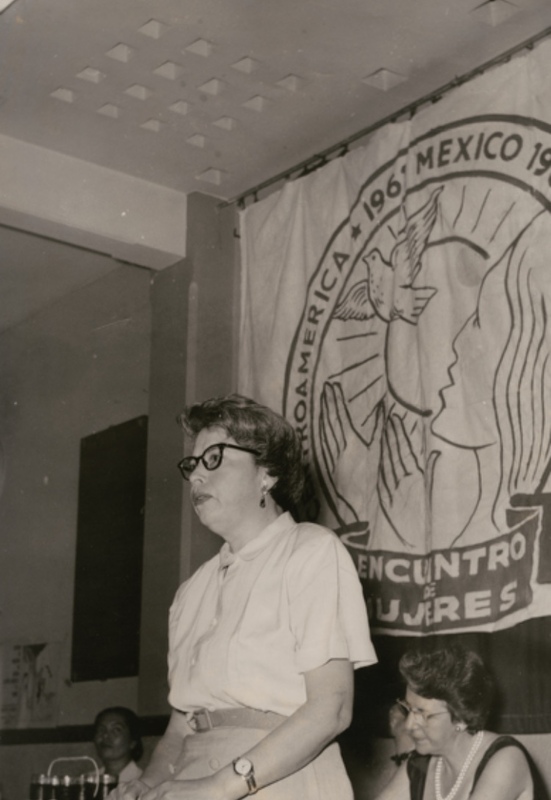 Francisca Flores addressing the First Convention of Women from Mexico, Central America, and the Caribbean, Mexico City, 1961. She also continued to focus on her writing, starting a newsletter called Carta in which she denounced McCarthyism and supported local community actions like the East L.A. walkouts. It is the Mexican-American who possesses the ability to enjoy life to its fullest and to find humor in the most trying situations…The Mexican-American has a glorious past and an unlimited, bright and wonderful future. As for self-definition, we can rightfully say that we are that ethnic minority that transcends and rises above all others. We are that ethnic minority that helped to build a strong America and who continue to strengthen and influence the American society on every front. Although Flores increasingly turned over the creative reins to the younger generation, she continued to write for Regeneracíon, often preaching feminist ideals that seem fresh and true even today. “Women must learn to say what they think and feel and be free to state it without apologizing or prefacing every statement to reassure men they are not competing with them,” she wrote in 1971. Flores would continue her activism as she got older. She was a member of the Chicano Press Association and served on the U.S. Civil Rights Commission. At age 66, she marched for the Equal Rights Amendment in Washington, DC. In 1980, she went to the United Nations Conference on Women in Copenhagen. “Nobody gives you rights,” she liked to say. “But they are always trying to take them away!” She died of a heart attack on April 27, 1996. Flores’ life is rife with lessons, perhaps most important that change comes in all shapes and sizes, and revolutionary thought takes many forms. Regeneración: Three Generations of Revolutionary Ideology is on display through Feb. 16, 2019, at Vincent Price Art Museum, 1301 Cesar Chavez Ave., Monterey Park. Previous articleThe 8 Best Things to Do This Week in L.A. The Death of Photographer Laura Aguilar Is a Major Loss for L.A.